We supply Britax Automotive Equipment Utility Bars which use a specifically designed black anodised aluminium support bar with a center sealed cavity for wiring protection ensuring these bars are robust by nature. Top and bottom rails provide flexible bar mounting options and allows easy attachment of accessories which makes these bars versatile by design. Narva Mine Bars are designed and made in Australia for the toughest of mine environments. 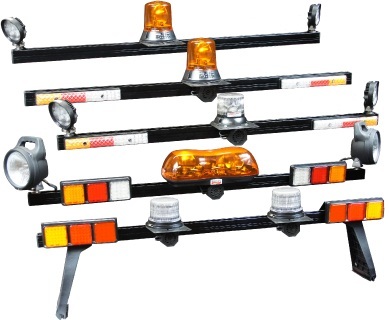 Made from black anodised extruded aluminium and stainless steel hardware, the mine bars are fitted with a 4m harness, reverse alarm, rear stop/tail, indicator, and supplementary reverse lamps. Choose from the comprehensive range of quality components available to best suit your applications.